This article explains several different methods of Jewellery Manufacture and examines the effect on a final appraised value, for these methods. We have chosen a typical solitaire ring made in 18ct gold, similar to the photo, and set with a diamond of 0.15ct. Now, let’s consider the methodology of several methods of manufacture. How do they affect the final value of the ring? To supply an answer to the question, an appraiser would first need to know what the ring weighed, consider how it was made, the price of gold on the day, and the economic factors – the ‘exchange rate’, using the NZ$ to US$ – at any particular date. This is important to consider, as all precious metals and gems are traded world-wide, using these figures. So, how was it made? Here are several examples; the first four rings are cast, all of a similar finished weight and set with the same 0.15ct diamond. 1. Large run production piece, (one of a production run of 20 – 50?) it is ‘one piece’ cast, rhodium plated setting, had minimal hand finishing and then set with the diamond. It would have a final appraisal value of $1,200. 2. Large run 2 part ‘production’ cast, with a yellow gold shank and a white gold setting, part finished, assembled, set with the diamond, finally hand finished, and the setting rhodium plated. The ring has a final appraised value of a little more, due to the extra time taken. It would have a value of $1,350. 3. Short run cast. 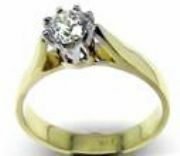 The pattern was hand-made and then cast in two parts, a yellow gold shank, white gold setting, then part finished, assembled, finally hand finished and set with the diamond, the setting rhodium plated. This ring has a final appraised value of a little more, also due to the extra time taken. It would have a value of $1,600. 4. CAD designed. This is also cast, but the patterns were machine produced, using the newer type CAD system (Computer Aided Design). It is also in two parts, a yellow gold shank, white gold setting. Again it is part finished from the castings, assembled and then hand finished and set with the diamond, again the setting rhodium plated to finished it. This ring has a final higher appraised value, due to the charge of the CAD designer and to the extra time taken. It would have a value of $2,000. All the above rings superficially look the same, but you can see from the descriptions, they are very different with regards to the methods of manufacture and the time taken. The value differential in this sample exercise is $800 between the first and last method. That is approximately 67% difference! Appraisal methodology, dictates that an appraiser, to do their job correctly, has to try to identify which of these methods (and there are several others), may have been used, in manufacturing the piece, and so arrive at the most appropriate value. Now … consider Ring number 5. A ‘one off commission’ by a skilled jeweller (meaning several design discussions have taken place), again in two parts – shank in yellow gold, setting in white gold, who ‘hand makes’ and finally hand finishes the ring, sets the diamond (or has it set by a skilled specialist setter) rhodium plates the white gold setting, and presents it in a special ‘presentation’ box to the client. This ring will have a final assessed value of say $2,900. This, compared to the first ring is a difference of $1,700 – over 200%. It is extremely difficult for the appraiser to differentiate between all these techniques, and when we also add imported items into the mix the situation becomes even more complex. It would be a benefit if manufacturers stamped their mark on items. This would immediately separate those rings that deserved New Zealand labour rates from those that don’t. Stamping of one’s personal mark, also indicates the skill and status level of maker, for example, if they specialize in individual pieces or small production runs. Incidentally when a maker stamps their mark on a ring they are also placing a guarantee on the metal quality by declaring themselves responsible for the piece, this lifts the piece from a ‘no name’ into a branded piece, which in turn lifts the value. On occasions we have been presented with a ring made by the ‘2 part cast method’, and yet, if we are not advised which method has been used, a well finished 2 part ‘production ring’, may not be readily distinguished from a 2 part, assembled ‘fully handmade’ ring from any of the four cast methods above. This indicates, how important it is, if known, for the jeweller or person who presents a ring for appraisal, (or for that matter, any item for appraisal) and we emphasis, if it is known, to disclose ALL information, to allow the most accurate final appraisal. Not doing this could and often will disadvantage a piece, and therefore a client, as an appraiser could inadvertently make a wrong time charge call and supply a lower than expected value. It is often possible for an appraiser to examine a ring, sent in with information, stating “the ring is fully hand-made”, but on examining it, the appraiser sees indicators, that cause them to write in the appraisal document – “the ring appears to be assembled with cast and hand finished components”. When the maker is questioned, it turns out that the ring was a special order, patterns were hand carved in wax, then cast and hand finished. However, this is NOT a fully hand-made ring. If fully handmade, it would have taken more time and possibly greater loss of metals than if cast, so the appraiser had made the right call. Assembled machined production components. Assembled part machined and part cast components. Assembled part hand-made and part machined production components. From these you can see, a ring is a ring, but really what sort of a ring is it? Remember, the final figures listed, are not necessarily ‘factual’, they are meant to be a demonstration of just how important it is for an appraiser, to consider how a ring is made and with all other factors, finally arrive at as accurate a final appraised value that they can. ‘Appraising jewellery’ is not an exact science, and often no information is supplied, so without all known parameters, on (hopefully) few, occasions an appraiser may make a wrong judgment call. If this article achieves one thing, We would hope you are now aware of some of the problems that an appraiser has to consider and we hope that you may be more diligent and accurate in supplying, if it is available, as much information as possible, to assist your appraiser. Ask your client if they have any information that will help in the appraiser preparing the most accurate final value as possible. This may be a sales certificate or a gemstone certificate, with the weight and grades prepared, on the loose gem/s, or possibly a previous appraisal, that refers to available information, that can then be researched. The mounts used to display gemstones require particular attention from an appraisers perspective. Their types of manufacture are quite varied and this will lead to considerable differences in price due to different labour and metal content. By Bill Palmer (Advanced Gem Laboratory) & Steve Crout (Jubilee Jewellers), both are members of the Jewellery Appraisers Society of NZ. Article reprinted from ‘Jewellery Time’ magazine of the Jewellers and Watchmakers of NZ Inc. June 2007 issue.